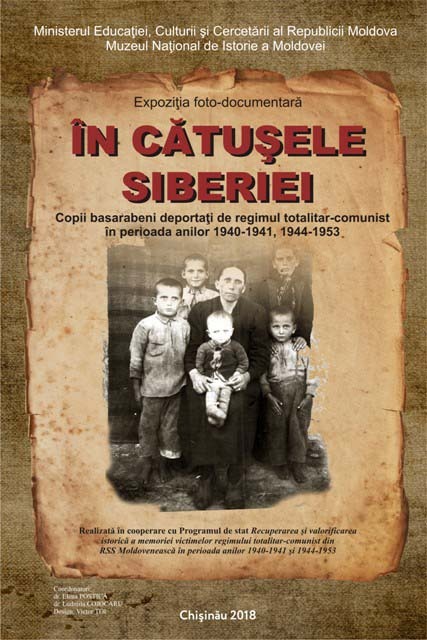 The National Museum of History of Moldova hosts a photo-documentary exhibition entitled "In Siberian Shackles. Bessarabian children deported by the totalitarian-communist regime during the years 1940-1941 and 1944-1953". The opening scheduled took place on Thursday, July 5th, 2018, at 15.00. The exhibition brings together photographic images and documents reflecting the life of Bessarabian children raised in Siberia with their families during the three mass deportations conducted by the Soviet authorities in 1941, 1949 and 1951. Fragments of memories reveal the impressions and experiences of survivors who, along with their parents and grandparents, knew the plight of deportations and alienation from the homeland. The display brings back into the public space tremendous accounts of living conditions, education and work in the Siberian colonies. The exhibition will be open to the public in the upper hall of the museum until September 30, 2018.